Industrial work can be challenging, making sure that the correct equipment is available for employees is vital to keep them safe and to help them work efficiently. The glass fibre steps for industrial use, from Slingsby, are an asset to assist in the swift and safe completion of tasks. They have a specially designed moulded brace and foot pad to enhance the bracing strength and damage protection. These steps are extremely secure with horizontal back leg strengthening bars and extra knee braces on the front frames for increased rigidity. They conform to EN131 for domestic and professional use, and they have non-conductive stiles to 30,000 volts. The treads are slip resistant adding traction underfoot when the user is going up or down the steps. 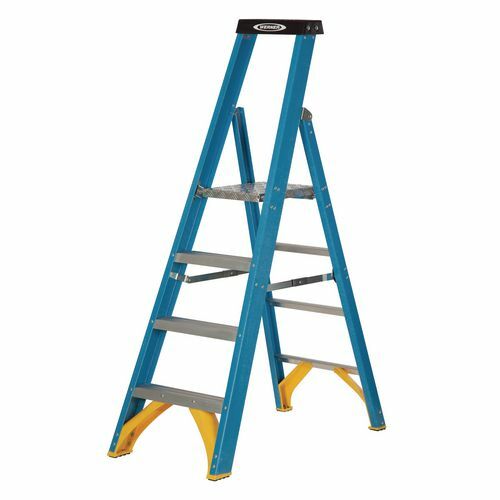 Our glass fibre steps for industrial use with a platform are a great choice to help your workforce stay safe while performing tasks at height. They come with a 12 month guarantee and FREE UK Delivery.